Note: This two-platform station, designed by William Bell, bore a strong resemblance to its neighbour Cullercoats (opened the same day, and still open on the Metro). Both platforms were equipped with ridge-and-furrow glazed awnings, salvaged from the Blyth & Tyne Tynemouth station (closed on 3.7.1882). With the growing popularity of Whitley Bay as a holiday resort and residential area the NER replaced the 1882 station with a much grander edifice on a new alignment. As the new station took shape the old one was progressively dismantled, disappearing under the lavish new structure that was completed in 1912. This station was renamed Whitley Bay (1st site) on 1.7.1899 and replaced with the present Metro station, Whitley Bay (2nd site) on closure. 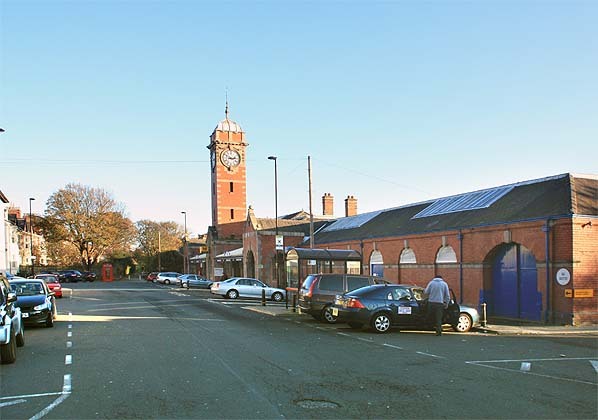 Whitley Bay (2nd site) survives on the Metro, a well-maintained and impressive facility, retaining its lofty clock tower, but the glazed platform roofing has been reduced in length. Tickets from Michael Stewart & JC Dean. 1887 Bradshaw from Chris Totty. Route map drawn by Alan Young. Whitley Bay (1st) station c1900, looking east, prior to the electrification of the route. Both platforms have ridge-and-furrow glazed awnings, salvaged from the Blyth & Tyne Tynemouth station (closed on 3 July 1882). The footbridge in the background is similar to that at Cullercoats (still in place in the Metro era). The brick-built stationmaster’s house is in the foreground. In many respects this station resembled the neighbouring Cullercoats which also opened with the ‘coastal’ route to Tynemouth in 1882. 1897 1:2,500 OS Map. Whitley (3rd) station, opened in 1882. The name was transferred from Whitley (2nd) at the same time – which was renamed Monkseaton (1st). 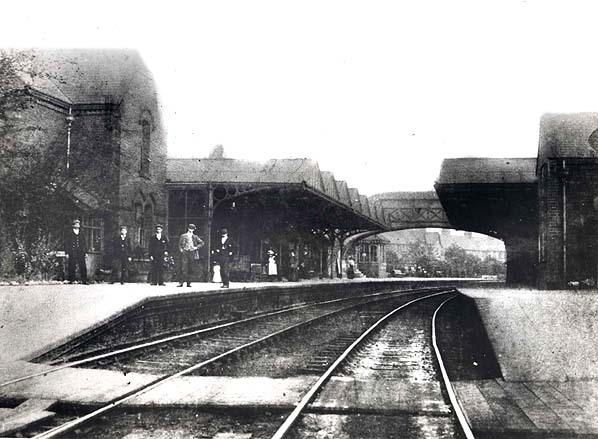 Whitley (3rd) shown here had substantial buildings on each of the two platforms. It was renamed Whitley Bay (1st) in 1899, and closed in 1910 when the present (2nd) Whitley Bay station opened. 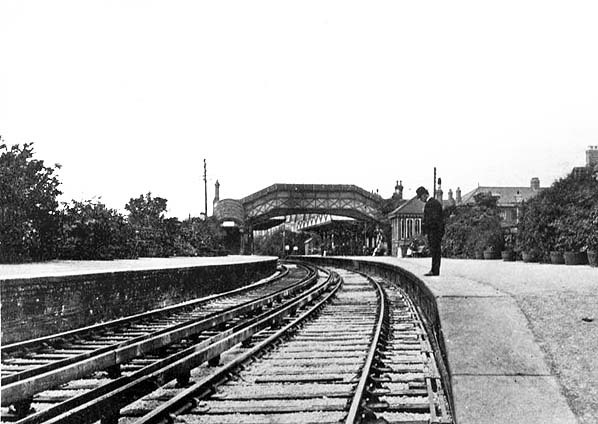 Whitley Bay (1st) station looking west from the north platform c1905. The electric third rails through the station were in use only from 1904 until 1910 when the present station (on the Metro line) replaced it and took over its site. The fine NER covered footbridge conceals the main building, but the ridge-and-furrow verandah can be seen. The signal box is on the north platform. The third Whitley station site was renamed Whitley Bay (1st) in 1899. 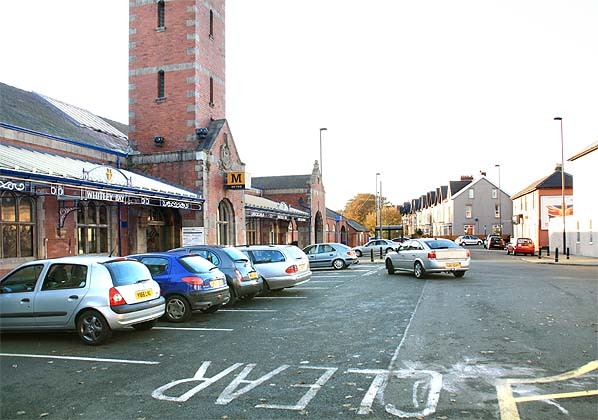 The station stood on the site now occupied by the main building of its successor, the present Whitley Bay, which can be seen here; its site possibly extended a short way into the forecourt. This view is looking east. The third Whitley station site was renamed Whitley Bay (1st) in 1899. The station stood on the site now occupied by the main building of its successor, the present Whitley Bay, which can be seen here; its site possibly extended a short way into the forecourt. This view is looking west.